As with most things of this nature, and I suppose life in general, you get out of it what you put into it. 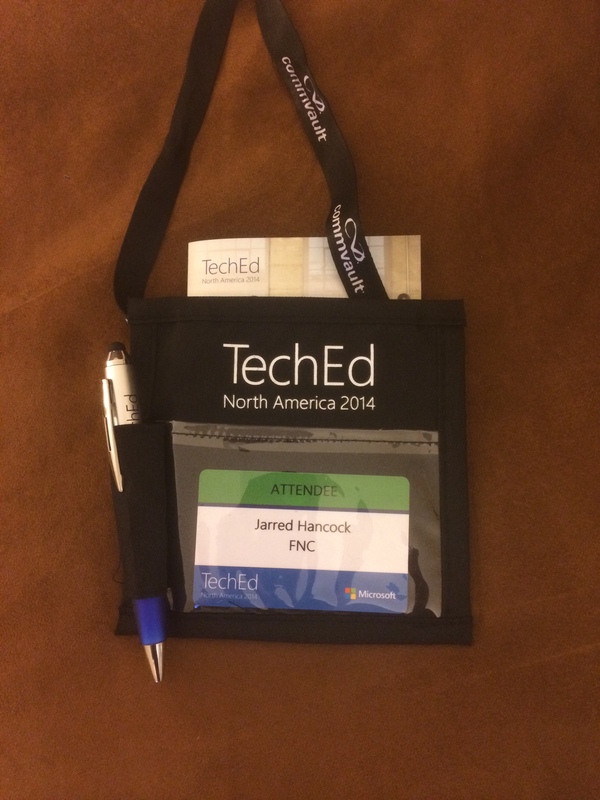 For me, TechEd was a great conference – one that I am glad I had the opportunity to experience, and one that I hope many others will be able to experience in the future. You can never underestimate, and I can never stress enough, the importance of getting out of your day-to-day bubble, especially the one named Oxford, Miss., and interacting with industry peers. There is simply no substitute. Unless you’ve been living under a rock the past several years, the push towards the cloud should be no surprise to you. TechEd 2014 did nothing but reinforce that point. I am so impressed with the work Microsoft has done in this space and the tools they are providing to make our lives and work easier, faster, and more scalable. It is great to see the behemoth that is Microsoft iterate so quickly. They are continuing to enhance their products at an ever more rapid cadence, and their Azure platform is simply amazing. You can choose to get on board or get left behind because there is no question where things are going. I went into the conference with a few specific goals in mind. I wanted to catch a glimpse of what was coming down the road in the .NET world – what the future of .NET looks like. There is no doubt that that future is bright. Whether that’s optimizations for cloud deployments, cross-platform support, smaller footprints, simplified project structures, etc., it is very exciting to see the direction things are moving. And who could turn down getting a chance to see Scott Hanselman present? He was every bit as good as you would expect. If you are interested, you can watch the first session here: http://channel9.msdn.com/Events/TechEd/NorthAmerica/2014/DEV-B385 and the deep-dive session here: https://channel9.msdn.com/Events/TechEd/NorthAmerica/2014/DEV-B411. I didn’t get a chance to attend the deep dive in person due to another session I had chosen to be in, but it is well worth the watch. I always like to balance high-level, forward-looking topics with information and knowledge that I can put to use immediately. With some of the projects we are working on right now, there were a few questions I wanted to try to get answered while at TechEd. We are doing a lot with SignalR to provide real-time updates to users on the Web and are also taking advantage of all of the asynchronous programming support in .NET 4.5. I was very curious about performance and scaling SignalR as well as best practices and things to watch out for with the new async and await patterns. Being at one of the premier Microsoft conferences, of course there was no shortage of information or opportunity to talk with others about these subjects. Two of my favorite and most beneficial sessions were on these exact topics. There were many, many more sessions that I enjoyed and learned a lot from. Whether that was around various aspects of TFS, performance optimizations of web applications, database performance analysis, debugging tips and tricks, or Agile methodologies, there was an endless amount of information to absorb and experts to talk with. All of the presenters were amazing, incredibly open to questions and feedback after their sessions, and very personable. I have enjoyed exchanging emails with several of them since I returned from Houston in order to get clarification or more information around various topics. They are first rate. I could go on about the conference for ages because it was just that good and I learned so much. The only negative was that it had to end. Then again, I guess that gave me the opportunity to come back and begin implementing much of what I absorbed and sharing that knowledge with others. I hope that everyone can make it a priority to attend TechEd, or similar conferences, on a regular basis going forward, and I’m excited to see the results of this trip manifest themselves in new products and enhancements to our existing offerings. o You launch and debug multiple browsers at the same time. This includes launching IE 7 and up, Firefox, Chrome, etc. o You can make code changes, style changes, js etc. Hit a refresh button and browsers you are debugging against will refresh so you can test your changes quickly in all browsers. o You can hit the control key and a toolbar will pop up in the browser. You can then inspect, move your mouse over the content and watch the code highlighted. o You can tweak changes right in the browser and (markup, css etc.) and immediately see changes in all connected browsers. o routes.MapMVCAttribbuteRoutes(); routes should be added to the route config. o Two-way communication between browser(s) and server. Browser Sync uses SignalR under the hood to keep all browsers in sync. o Opens an http request and downgrades it to a web socket which is great. o It will try many methods all the way down to polling if the more modern methods fail. o See the Move Shape Demo from the SignalR team website. I’ve never been to a Microsoft conference so I wanted to go for that experience and see what I could learn. I wanted to go and learn something useful that I could bring back with me and share. I think I did that. I would happily go to another conference if I had the opportunity. The only thing I would do differently would be to sign up with a fake email and phone number so I could screen all of the spam from the vendors after the fact! -Victor Pirkle, Software Developer II, FNC Inc.